Join the Rose Foundation’s Online Community! ¡Nuestras comunicaciones incluyen información en Español! New Voices joined the strike in San Francisco on Market Street and continued down to the federal building on Seventh Street to the office of House Speaker Nancy Pelosi. New Voices then continued with the strike and headed over to Senator Diane Feinstein’s office. 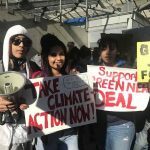 Although Pelosi nor Feinstein were in their offices that day, the students made sure their voices were heard. This entry was posted in News & Features, Newsletters and tagged New Voices Are Rising, newsletters.